"Which exercises can I do at home to improve my balance?" Last year, I created the Strong Foundations video series - a set of home exercise videos to help people who want to improve their balance and posture, feel stronger and more confident. The videos have been great, I do the exercises most days and they have been a great help. Hi, I’m Claudine, the founder of Vida Wellness. Over 5 years, I watched my grandmother lose the ability to get up and down the stairs. That meant she had to sleep in her living room, because she couldn’t get up to the bedrooms... And at my wedding reception, we had to carry her up the stairs to drink with us. It was heartbreaking. There’s a lot more to her story but the point is that I saw and felt the impact of reduced fitness on my grandmother’s life. This is one of the reasons why I do the work I do. I have seen what can happen to people who have trouble with their balance, when a trip on the pavement becomes a bad fall. They go from leading full, active lives to losing confidence and being frightened to go out. Broken wrists, shoulders and hips can be hard to recover from. The result of just one trip or fall on the pavement can be devastating. That’s why I spent many years training as an specialist exercise instructor. I have obtained numerous qualifications, studying in both the UK and the US. I have worked with people of all ages and with medical conditions including arthritis, osteoporosis, cancer, heart disease and Parkinson's. Over the last 15 years my team and I have helped thousands of people to improve their balance. I am so grateful for the opportunity to have worked with all the people I have. I see all the challenges they are going through (caring for spouses, helping with grandchildren, dealing with health complications) and am continually impressed by their strength of character. They keep on going with the exercises so that they can keep on going with all their other commitments. I feel honoured to have been able to help them improve their balance and continue with their busy lives, and would love to help you too. The video made the programme `alive’. It was easy to follow, fit into one`s day, and, because it’s not too strenuous, I felt better at the end of the work-out. Thanks for sending the videos to us! They aren’t the least bit intimidating and couldn’t be clearer. I find having a video rather than a written exercise plan much more motivating and easier to stick to. The videos support home exercise because you appear to be working with another person who is encouraging you. This is especially important for those of us who live alone. The exercises in the Strong Foundations video series will help you to improve your balance and feel more confident. You will strengthen the muscles you use in everyday activities and improve your posture. The videos are for people who want to exercise at home with the support of a specialist instructor. I talk you through all the exercises and demonstrate them clearly. There’s no loud music, no leaping around and no pressure to work harder than you want. The shortest (and most popular!) video is only 8 minutes long. 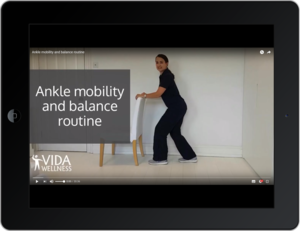 The series also includes the Vida Wellness guide to Safe & Successful Home Exercise (in PDF format). The videos are all online - just click on the link in the email (no password needed). You can watch the videos on any device (laptop, PC, tablet or your phone). Your videos are brilliant, clear and easy to follow. Check your inbox straight away for a confirmation email. Please click on the link in this email. You will immediately receive a link to five, free videos and your PDF guide.